Home / NEWS / NEW EMPLOYMENT FOR PRIMARY AND SECONDARY TEACHERS MARCH 2018. NEW EMPLOYMENT FOR PRIMARY AND SECONDARY TEACHERS MARCH 2018. 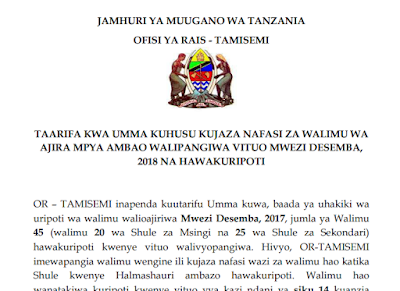 The government of Tanzania through TAMISEMI has announced the list primary and secondary teachers recruited for job march 2018 in order to recover those teachers who did not report during recruitment of December 2017. You can view them through downloading the link below in pdf. 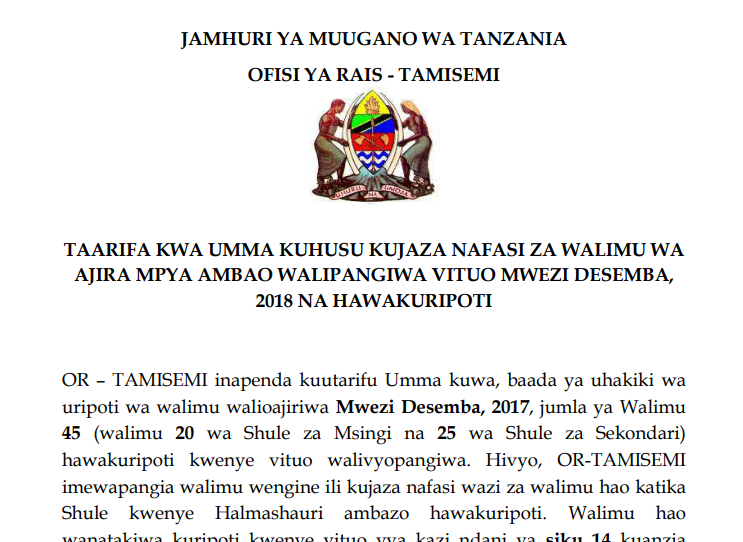 NOTES OF GEOGRAPHY SUBJECT TANZANIA BASED SYLLABUS. HISTORY STUDY NOTES FOR ORDINARY LEVEL (O'LEVEL) TANZANIA BASED SYLLABUS. HISTORY FORM THREE TOPIC 1: ESTABLISHMENT OF COLONIALISM. .
HISTORY FORM THREE TOPIC 4: COLONIAL SOCIAL SERVICES.